Call Ideal Restaurant Supply Now! Make an Appointment for Demonstration ! - Reduced resource consumption. Advanced design and performance. - Proven reliability backed by standard two-year parts and labor warranties. 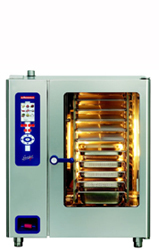 - Time-delay programming can hold cooking or cleaning starts up to 24 hours. - Energy-Saver mode reduces power consumption. - Two-speed, auto-reverse fan provides optimum air circulation, reduced speed capability and even heat distribution. - Sensors control two-stage cool down of condensed water. 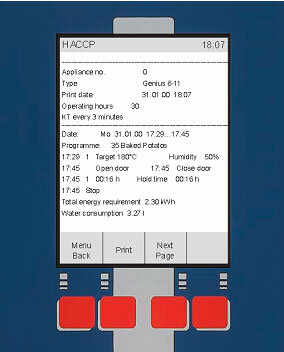 - HACCP data is stored in built-in memory, which records information automatically and captures the prior 200 operating events. Information can also be downloaded and printed. 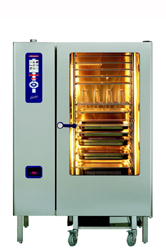 - Manual humidification button allows injection of steam on demand. 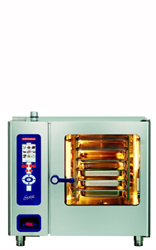 - Integrated multi-point temperature probe ensures precision cooking. - Built-in odor seal with back flow prevention device and protective overflow valve. Make an Appointment for Demonstration!